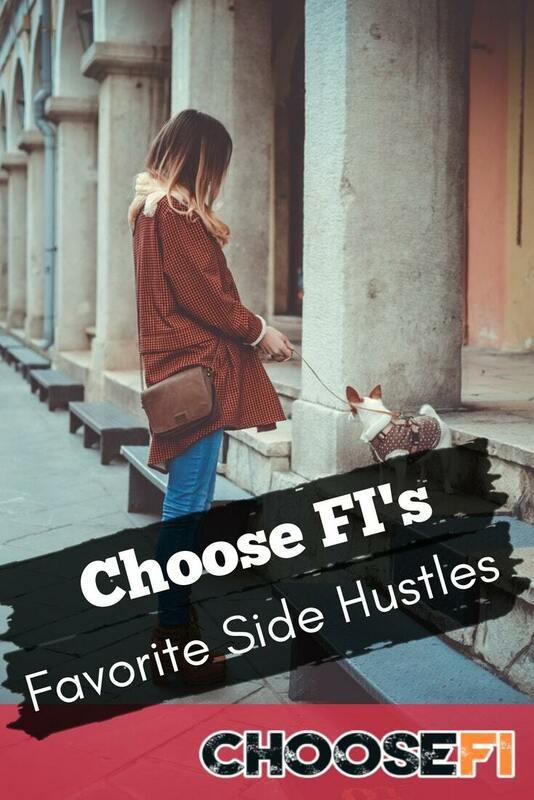 Side hustles are a great way to earn some extra cash to help you speed up your path to financial independence (FI). We’ve shared a list of great side hustle ideas here, but we wanted to feature some particular side hustle stories to inspire you to earn some extra cash, too. Today, we’re delving into the freelance writing side hustle. This side hustle is particularly popular among bloggers, but anyone can be a freelance writer. Today, I’ll share my story about how I got started with my freelance writing side hustle and what it’s turned into. Freelance writing wasn’t my first side hustle. My first major side hustle was actually personal finance blogging. However, without starting my personal finance blog, there is no way I’d be a freelance writer today. My freelance writing side hustle was a complete accident. One day, an editor at a corporate blog happened to visit my personal finance blog. She liked what she saw and sent me an email to see if I would write for their blog for pay. I had seen other bloggers freelance write for other blogs besides their own, but I never understood why. However, when I was offered $60 per blog post to write for the corporate blog, I finally understood. Freelance writing paid good money and it was a way to diversify my side hustle income. I said yes and started writing for the corporate blog on a weekly basis. Eventually, other corporate blogs and personal blogs started reaching out to me to see if I’d be interested in writing for them, too. While I never intended to be a freelance writer, I wasn’t one to turn down some extra side hustle income, either. Over the months and years after I landed my first freelance writing client, clients have come and gone. In the beginning, I only accepted freelance writing proposals when people asked me to write for them. After all, I wasn’t looking to be a freelance writer. I wanted to be a full-time blogger. However, as I got serious about diversifying my income, I started looking for new freelance writing positions. In late 2015, I decided to quit my day job to become a full-time blogger and freelance writer. I realized having regular income was super important, so I actively looked for a couple of new freelance writing clients. At the time, most of my clients provided regular work on a weekly basis, so it was a great way to earn a somewhat stable income while I built my blog. In addition to using my network to look for new work, I met with some companies looking for freelance writers in person at FinCon, a conference for financial media and bloggers. FinCon has easily been the best thing for my freelance writing business. When you meet people in person, it’s much easier to land a new gig. Thankfully, several of the potential clients I met with at FinCon have turned into regular freelance writing clients. In the last few years, I’ve had some clients shut their blogs down which left me scrambling to pick up new work. Other times, editors have left and the freelance writers that worked for them, which included me, weren’t retained. Thankfully, there always seems to be plenty of companies looking to hire freelance writers that allow me to replace the clients that leave. As time went on, I became a more experienced writer and my rates have increased, too. I now earn much more than $60 per article. In fact, I’ve made over $1,000 per article for some of my longer and more detailed assignments. In total, I earn thousands of dollar each month from freelance writing. While the number varies each month depending on my clients’ needs, I earned over $5,000 from freelance writing just the other month for the first time. Add that plus my blogging income, and it’s clear to see that my side hustles have turned into a full-time career. Personally, I feel like freelance writing is a great side hustle. You can typically write whenever you please as long as you meet your deadlines. When I was working full-time, I wrote in the evenings and on the weekends. Now, I take advantage of the flexibility freelance writing offers. I can take a day off during the week to spend time with my family if I want. However, I might have to write in the evenings on other days to catch up. The key is I get to choose when I work. Freelance writing isn’t the easiest side hustle to break into. When you’re first starting out, you may have to write for free to get your name out there and build a portfolio. Some people write for others by offering free guest posts, but you can start a blog and make that your portfolio, too. Over time, you’ll be able to start charging for your writing and you can increase your rates as your writing improves. Like many careers, you’ll make more money in some fields than other fields. Writing about personal finance pays pretty well, but writing about other subjects isn’t always as lucrative. If you do decide to try your hand at freelance writing, it’s important you take your side hustle seriously. Your clients will depend on you to submit quality work. Never plagiarize. Always meet your deadline. You’ll also want to make sure you communicate clearly with your clients. If something comes up that could put you in danger of missing a deadline, let them know as early as possible so they can prepare. Make sure you update your LinkedIn profile to show that you’re a freelance writer for hire to get some free visibility. You can also build a portfolio on Contently. Once you choose a specific niche, consider attending conferences where potential clients attend. Meeting people face to face is the best way to make sure they’ll open your email when you have a great idea to pitch them. 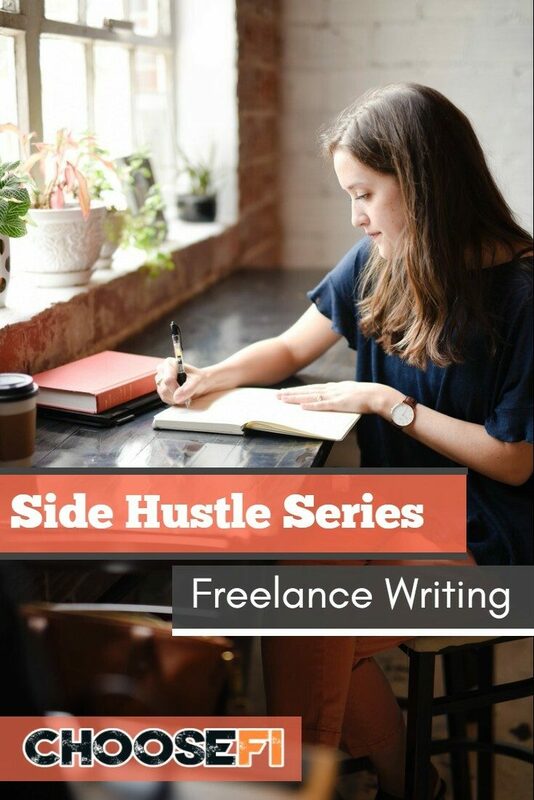 Like with any side hustle, the key to starting a freelance writing side hustle is to simply get started. Start a blog. Write a free guest post for a blogger to start your portfolio. Take action! In a few years, you might be a full-time freelance writer just like I am. No matter how hard you try, you can only save so much by cutting back your expenses. While living a frugal lifestyle will go a long way to help boost your savings rate, there is another option that could result in a drastic increase in your savings rate. Technically you don’t have a limit to the amount of income you can earn. While you may be limited to earning a certain amount at your day job, starting a side hustle could earn you a few hundred dollars per month in addition to that day job income. 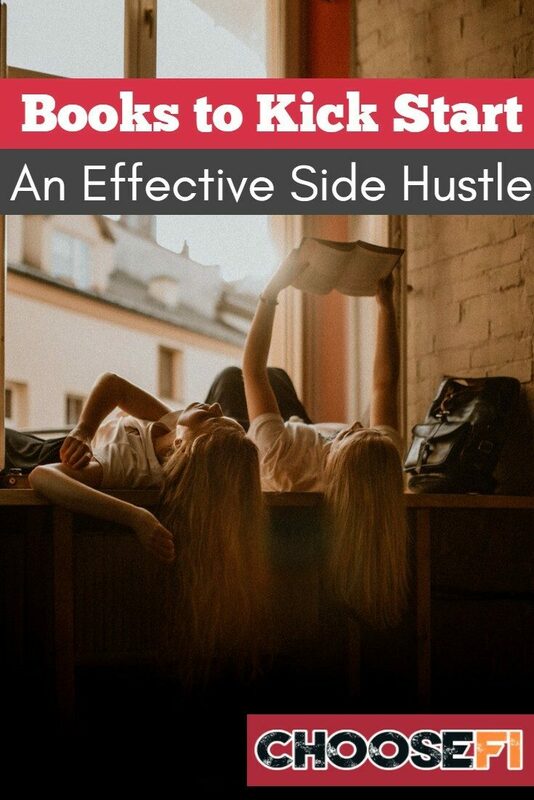 If your side hustle turns into a full-blown business, your business could eventually earn you multiple times the income you earn from your day job. Here’s a list of some of our favorite side hustles, ideas for a way to boost your savings rate or simply earn some extra money to enjoy a few luxuries. If you make money using one of these side hustles and want to share your story, reach out to us. We’re looking to feature side hustlers on the blog and will link their stories to the side hustle ideas below as they’re added. One great way to earn some extra cash is selling or reselling physical items. Whether you just want to get rid of the stuff in your home that you haven’t used forever or you want to create and sell something like custom furniture, selling physical items can be quite profitable if you know what you’re doing. You’ll want to focus on selling popular items that have a high profit margin to get the biggest bang for your buck. If what you sell is small, you might be able to ship your physical products after selling them online on websites like eBay, Etsy or even through Amazon. If your items are larger, you’ll probably want to sell locally to avoid shipping costs. This is especially true if you want to flip or refinish furniture. You could even flip cars if you’re great at assessing the mechanical condition of a car or can fix it yourself. Just make sure you abide by any dealer laws in your state. Websites like Craigslist and Facebook marketplace can help connect you with potential buyers. You can try your hand at retail arbitrage, if you want to take things to the next level. Essentially, you buy items locally at a low price then sell the items online at a higher price. You can usually find items at garage sales or on clearance at big box stores. The key is knowing your market so you can pounce when you find a good deal. Selling products isn’t for everyone. Luckily, there are plenty of services you could provide your local community to earn a bit of extra cash. Here’s a great list of ideas to get your creative juices flowing. You can create a website to advertise your services in detail and use local Facebook groups, as well as word of mouth, to get people to your website to book your services. Just make sure you’re following any laws that may apply to the service you provide. If you have certain assets, you may be able to use them to earn extra money through a side hustle. In particular, you could become a landlord and rent out properties on a long-term basis. If you live in a tourism destination, you could rent out your property on a short-term basis. If you have an extra room or two in your home, you could rent it out on AirBnB to earn some extra cash. If you have a car, you could rent your car out or drive for a service like Uber or Lyft. If you don’t feel like driving people around, you could deliver food through UberEats or deliver groceries through other delivery services. Think of ways you can use the assets you already own to start generating some additional income. Have an RV you aren’t always using? You could probably rent it out! Earning money online is totally possible. Whether you want to start a blog or start a YouTube channel, realize these types of online income take time to build up. If you want a more immediate stream of income, consider providing a service. You could make money freelance writing, editing, offering website or graphic development services or by teaching English as a second language through VIPKid. You could develop specialized skills and become a virtual assistant or simply test websites through UserTesting. If you already have expertise that you could use to answer questions for others, such as being a lawyer or accountant, you may want to consider answering questions for money on sites like JustAnswer. Making money online isn’t always intuitive or easy, but there are plenty of ways to make a ton of money if you learn the industry and put your mind to it. For instance, MK Williams self-publishes books to earn some extra cash. Side hustling doesn’t have to be about starting your own business. You could easily make some extra cash by picking up a part-time job in the evenings or on the weekends. If you’re available to work during the day, consider being a substitute teacher. If you’re willing to help others out medically, you could consider donating your plasma on a regular basis to earn a bit of extra cash. Alternatively, you could take part in medical trials. While this sounds risky, many times medical trials need control group participants that don’t receive treatment to compare to those that actually receive the test treatment. Side hustling is awesome because there are endless options to pick from and your income is technically unlimited. You can use this money to send your savings rate to the stratosphere so you can retire even earlier. You may even find something you love doing that pays extremely well in the process. In the worst case scenario, you might try out a side hustle and decide you don’t like it. If you don’t like it, you can try something else. That’s a lot of upside for very little downside in my book. If you have a side hustle that isn’t included in the list above or want to be featured as a side hustler, let us know. Want to read more from Lance? Check out the rest of his articles here. Side hustling truly is FI’s secret weapon. Working your day job can help build security into your life, and of course–perks like health insurance, a 401k match and a reliable paycheck. As great as that security is, it can be deflating to realize you may be locked into a pay grade for some time, and you won’t be able to grow your income as fast as you’d like. Side hustling is a great way to experiment with entrepreneurialism in your off hours to build in extra income, acquire more skills and, of course, sock away as much extra cash as you can to put towards early retirement. If your desired side hustle involves a bit of creativity or booking clients, this book is absolutely excellent in framing up your pursuit and defining your “why.” While it’s great to learn the tactics of finding clients, booking and billing–avoiding burnout and staying competitive is also key to your long term success. The authors are both creative entrepreneurs who have launched successful businesses in design and consulting. They have added a highly successful blog and podcast, as well. You will learn actionable tips to build in effective workflow, build boundaries, and establish measurable goals. Chris Guillebeau is a slightly more approachable version of Seth Godin and really hones in on the demographic of people that don’t want to start the next Apple or Shipt, but instead build a path to self-employment or a small business with little or no capital. Chris blogs and writes most of his content for the solopreneur who is simply working to supplement or reproduce their income by starting a side project that can be scaled to whatever level helps them get to their goals, especially without the need for investors, overhead, or a ton of risk. Both of these books are great to get thinking and see practical applications of people who have created profitable side hustles, with little to no capital and in a short amount of time. Susie crafted this book to help you get from a passion or hobby to a side hustle that’s successful on your own terms. She provides guidance to help you earn an extra source of income by doing something you love–whether it’s selling necklaces in an Etsy Store or picking up consulting work with skills you picked up in your day job. Her style is very approachable and she takes you through all of the planning stages and potential obstacles, creating a mindset for success and how to create multiple revenue streams to ensure you’re focusing on the right things as you grow. 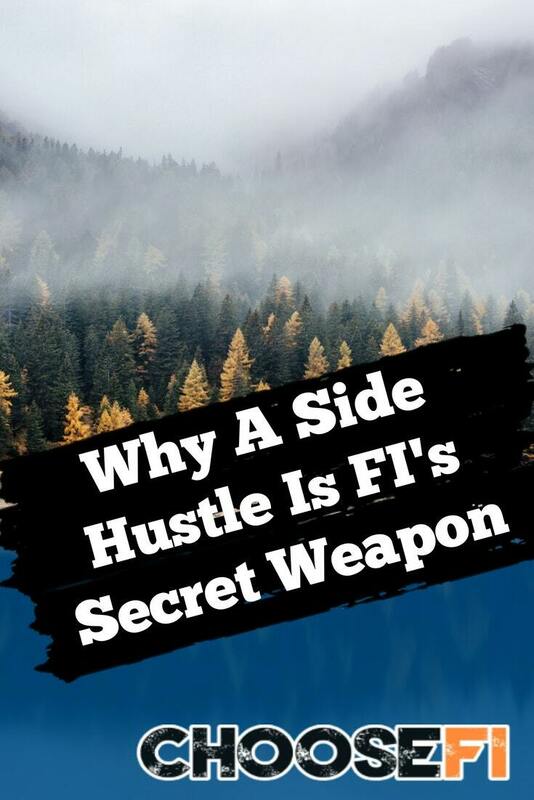 If you recognize the fastest path to FI is to earn extra side hustle money, but struggle to see yourself as someone who is an entrepreneur, or how you can fit an extra project into your already busy life, this is a great book. Dorie dives into the mindset of a successful entrepreneur to help you see yourself beyond simply being a worker, to someone who can monetize their expertise and use it to create alternative income sources beyond a traditional 9-5 job. Amy has built a successful YouTube channel and knows her way around social influence platforms. While many books on blogging (and in this case, vlogging) are a bit dated at this point–Amy released this book in 2017 to help you make money on the internet as an influencer. If you’re thinking of doing a blog or vlog as a side hustle, this is a great book to pick up! Vincent and his wife Elizabeth started a photography business to earn extra cash as they were starting to grow their family and because Vincent’s day job wasn’t helping him scale his income or get paid what he felt he was worth. In just a few years, they grew their photography business enough to help them pay off their debt, including their mortgage and were able to work for themselves. If you’re looking for a roadmap to do the same, check out this book. These books are a just a tip in the right direction, with so many to choose from. What are some of your favorite books on side hustle success? I recently listened to a thought-provoking podcast interview from McKinsey Consulting about the future of work. It was based on a recent report on the projected impact of automation on the nature of work by the year 2030. Further digging revealed a very interesting global discussion that is now underway on what work may look like in the coming decades. It’s important to first highlight that work does not necessarily mean income. What do I mean by this? While many of us bring income into our lives through a job or career, there are other ways to achieve income such as through real estate, earnings from investments, sales from your side hustle etc. When we think about the future of work, it will apply to our “9-5 job”, including what jobs will be available, which will no longer be relevant, as well as the individual tasks and activities that make up a job. In addition to having an impact on jobs and how we work, these large-scale changes will likely have broad implications to our other streams of income. Over the next 25-30 years we expect to see the continuing rise of incomes and prosperity around the world–particularly in countries currently viewed as emerging markets or low to middle income i.e. India, China, Nigeria. For example, it has been estimated that another one billion people will be entering the consuming class over the next few decades! In addition, in many countries a large proportion of citizens are getting older i.e. Japan, Germany, Italy, U.K, Canada, and USA. Both of these trends will likely have tremendous impacts on economies, such as more people being able to buy stuff and the need for goods and services directed at older folks, such as healthcare. There is an ever-increasing integration and connection between countries. This includes trade and legal frameworks, transportation and communication networks. Globalization is having an affect on how goods and services move across geographies, as well as how ideas and cultures are becoming more connected. This is already having profound impacts on economies and labour markets, including jobs moving from one country to another and the rapid spread of ideas and technology. As technology progresses and becomes more sophisticated, automation is allowing for an increasing number of tasks traditionally performed by humans to become automated. At first, these will likely focus on tasks considered more easily automated such as some clerical and basic paralegal work (in fact, this is already starting to happen). However, with artificial intelligence and the availability of ever increasing computing power, more complex tasks are also likely to become automated. One telling statistic estimates that for about 60% of current occupations, at least one third of the activities associated with these jobs could be automated with current technology. Together, these global trends are likely to cause dramatic changes in the way we work. In fact, some reports suggest that this will be more profound than our shift away from agricultural or manufacturing based economies. The term “Fourth Industrial Revolution” has been used to describe this new era, with the way we work being only one part of it. There is great potential for the Fourth Industrial Revolution, including a shift in economic and societal structures enabling a focus on the world’s well being. Not just more stuff for more people, but a way that we can reduce inequalities and have a diverse, safe, just and healthy world. Awesome! Why does this matter for our journey to FI? Of course, the only thing that we can be certain of when thinking of the future is that nothing is certain! So what does this mean for our journey to Financial Independence (FI)? As you know, to reach FI there is a simple formula that we can think about –> Maximize net funds and minimize time to get there. And how do we do this? By maximizing income and minimizing expenses. 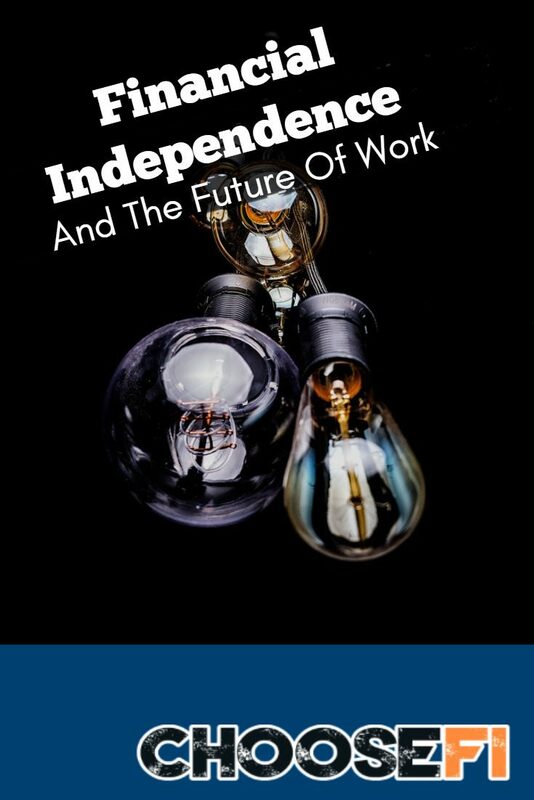 What else matters for the future of work and FI? It matters where you live: It seems that these large global trends will play out slightly differently depending on where you live. This is because some parts of the world are considered more established economies where as others are at different stages of development and industrialization. This means that some countries may be shifting to the 4th Industrial Revolution before they’ve had a chance to let the 3rd version fully play out. Also, the proportions or make up of different industries or sectors of work will matter. For example, those places with a high proportion of work in routine manufacturing will likely experience big changes with the integration of automation versus those areas that already have most of their workers skilled to take on this new way of working. It matters about the skills and competencies we develop: There will be some new skills and abilities that our children and we will need to meet these changes. This will include thinking about what we as humans can do that automation cannot do. Creative and design work? Intuitive and abstract thinking? We will have a chance to dig into this a little more in my next post. So, what will this mean for income and the FI journey? There will still be lots of work available: Some jobs will fade away and others will emerge. For the most part it’s thought that there will not be a decrease in the number of jobs available but a change in the nature and type of jobs instead. More people able to buy stuff: With the expanding consumer class there will likely be more people interested in purchasing your goods or services. So no shortage of happy shoppers out there! Changes to types of goods and services that people want: Many places have already started to see dramatic shifts in age, culture and ethnic make up of their communities. This means that there are opportunities to provide goods and services that are more reflective to our changing society. For example, with an aging population there may be a change in consumer tastes from durable goods (such as cars) towards services (such as health care). More work via the Platform Economy: This is what we have heard about on several ChooseFI podcast episodes related to blogging and making money online (refer to podcasts 69R and 73R). More broadly, this ‘platform economy’ allows for jobs to be broken down into a set of smaller tasks. This creates opportunities for side hustlers and even full time workers to take advantage of freelancing to produce income. This also includes things under the ‘gig’ economy such as AirBnB and Uber. Going forward, we may see even more of this kind of work so that folks can take advantage of the flexibility and extra income that this kind of work affords. Better able to match work and workers: It is suggested that advances in technology are going to help facilitate new and more efficient ways of matching the demand for and supply of labor. There has often been a disconnect here and going forward, more jobs might be available because there are better ways for employers and employees to find each other. So, this could be the dawn of a new era. With our entrepreneurial and ‘go getter’ FI spirit, I know that we can adapt and thrive in this new era. And even more, my hope is that the FI community can be a part of realizing the aspirational new world that can be happy and healthy for all of us! For discussion–are you starting to see any of these changes playing out in your community,industry,work place? What do you think might be the impact on your journey to FI? Want to read more from Ms MoneyPenny? Check out the rest of her articles here. Reaching Financial Independence Without Index Funds? There is magic in the side hustle. If you’re on the path to FI like most of us are, and you’re not already making six figures with three rental properties already under your belt, side hustling can be a lever to FI you’ll want to pull. Honestly, there’s only so much you can do to cut costs, even with awesome ways to cut recurring expenses like house hacking and going carless, you’ve likely spent ample time in your FI journey cutting costs. So, what’s an aspiring FI’r to do? Earn more. Now that we live in the internet age, making money is easier than ever. We are surrounded by a breadth of knowledge in the form of free podcasts, YouTube videos, blog posts, and Facebook groups. Our libraries are chock full of free books, and if that weren’t enough, we also have the ability to network and reach a vast pool of potential buyers and clients once we’re armed with new skills we’ve acquired. If you have an internet connection and a desire, you too can side hustle. You may absolutely love your day job, and it can be chock full of perks and fabulous health insurance–but you realize you’ve hit a ceiling. Even in the best of circumstances, a nimble and loyal careerist is still competing with an array of other employees who are vying for promotion. If your progress isn’t chugging along quite as fast as you’d like, you realize you have two options: get promoted or get a slight raise to help keep pace with inflation. You could also consider job hopping (which can be fruitful) but you’re still going to find the same slow and steady pace year after year. Day jobs are great because they’re reliable. But when you’re looking to reach FI income growth can be frustratingly predictable at your “real” job. Side hustles are awesome because they can be just about anything and you can choose how much or little time you want to commit to it. Now that the internet has taken away the middle man of traditional employment, you can work for yourself, if only for just part of the time. If you’re even vaguely interested in taking the entrepreneurship route for a spin, spending time with a podcast or YouTube video means that you can pick up skills in short order, and often, get paid while you learn and fine tune those skills. Side hustlers have earned income quickly by picking skills up online and working nights or weekends. With a basic understanding of how you want to collect money, track money and how you will report this money to the IRS and be in compliance (perhaps by setting up as an LLC), you can get started with a solid financial footing. What Types of Side Hustles Are There? Side hustles can be grouped in two types: virtual (sales or service) and in-person (sales or service). Choosing one or the other has drawbacks and perks, just like anything. Luckily though, if you have even a basic understanding of how to level up on your skillset and how to manage your appointments, cashflow and expenses–you’ll be off to a great start. With a plethora of Facebook groups and blog posts out there, you literally can research the best fit for your schedule, natural skills and financial goals. Virtual gigs can be done in your off hours, in the comfort of your own home. It also means you can cut overhead without having transportation costs or a storefront to maintain. It can be expensive to start a virtual gig if you need a new computer, or need to take a few courses–but if you’re resourceful, you can scrape by with what you have. A drawback of the virtual side hustle is that it can be hard to get noticed as a freelancer or service provider in a cluttered digital landscape. Yes, you can work in your underwear, but so can thousands of others trying to get the same freelance writing gig. How will you stand out, and how will you stay accountable with this flexibility? Virtual side hustles include gigs like photo or content editing, website maintenance or graphic design, being a freelance writer or other digital services. Taking online surveys or creating your own digital product like a course or e-book to sell on Amazon can also bring in some passive income. Being a pro-blogger has recently seen a spike in popularity as you can be paid for your influence, but you can also work as a virtual assistant for other folks who are doing exactly that. If you don’t want to build your own blog–you can help maintain one and get paid for it! In-person side hustles traditionally have more startup costs and are far less flexible in that you have to be somewhere and do something at a given time. Some side hustles involve a need for appliances, gadgets, vehicles and your greatest asset- time. In-person side hustles are more constricting in how you use up your free time. If you’re a photographer, precious daylight hours for portraits and treasured weekends for weddings will be key times to work- which sometimes can be struggle to balance. In-person side hustles include being a handyman (or woman), driving Uber/Lyft, running Airbnb from your home, dog walkers or sitters, fitness instruction, house cleaning, and other in-person services that require some facetime and are less flexible. So, are you ready to side hustle your way to FI-freedom? There are endless side hustle ideas out there on how you can earn more money in your spare time on nights and weekends, even while you work. Take advantage of the free podcasts and YouTube videos out there and get started today! So you want to create a website so you can get your side hustle going. Here at ChooseFI, we highly recommend a self-hosted WordPress site. To do this, you will need a domain and a host. While there are many hosting services available, we recommend SiteGround as they can meet your needs with just about everything related to your website. When I started researching SiteGround, I was pleasantly surprised by how easy it was to set up an account. The front page of the site is easy to use and doesn’t make it look like you’re designing a site for the late 90s. I'm not the only one; many others have shared their experiences, opinions, and how easy it is to use SiteGround. They have over a thousand reviews that give them a 4.99 out of 5 stars. But, let's dig into the details. Shared Hosting: Shared hosting is when multiple sites rely on the same server, which typically means the host can keep costs down low. Cloud Hosting: Cloud hosting utilizes virtual servers (like the iCloud) to host multiple sites. There are both public and private cloud hosting servers. Private clouds are typically more secure. Dedicated Servers: If you’re looking for your own server, SiteGround can set you up with one that will be managed by their experts. Reseller Hosting: SiteGround’s reseller hosting is meant for web designers and developers that maintain their customers' websites on a long term basis. 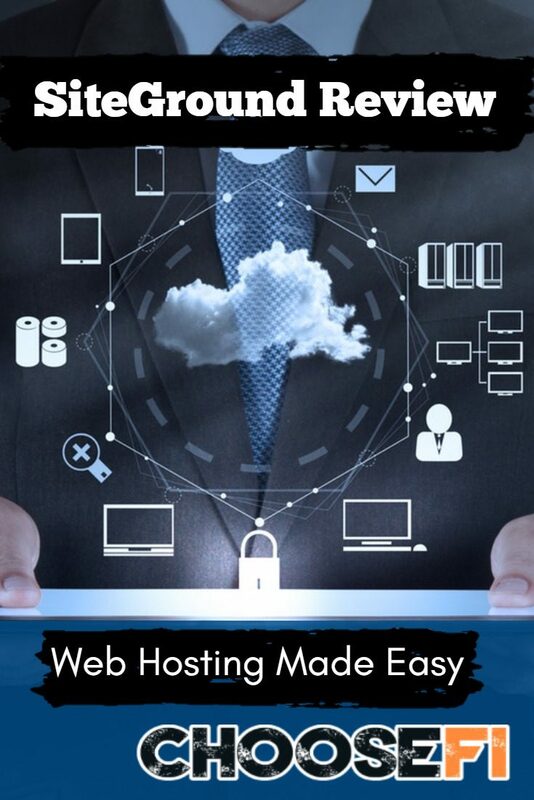 Enterprise Hosting: Finally, if you’re looking for top-tier hosting, SiteGround’s enterprise hosting can offer a server that was built specifically to your needs, which they will then fully manage for you! WordPress hosting: SiteGround’s WordPress hosting offers you managed hosting that’s built to ensure speed, and security when launching your WordPress site. WordPress themes: SiteGround offers free WordPress themes! Since their main specialty is WordPress, they want to offer themes that can help make your site look more creative and professional. WordPress tutorials: SiteGround also offers free WordPress tutorials for beginners—which are especially helpful when you want to start building your site, or if you want to add a few more complex features. For some of SiteGround’s services, they offer three different plans, so there’s a little something for everyone. But, before I tell you the prices, know that SiteGround is currently running a special, and the prices listed below are those specials. SiteGround is great when it comes to support for their customers. They have support agents that are available 24/7 through phone or chat. And for those who know nothing about technology, SiteGround can still help you set up and successfully run your site! They offer a set-up wizard to get you started, tutorials (not just for WordPress), and a webinar series. Looking around on the site and researching SiteGround, I would absolutely recommend SiteGround. If you're looking for something simple, you can pay the $3.95 a month (special price) and get started. But, what I found especially helpful, however, was the free WordPress services. It's not secret that WordPress can be difficult, so the tutorials alone are great if you need to go the cheap route and sign-up for WordPress. It doesn't matter if you're creating a site for the first time and looking for a reliable host, or if you want someone to do the nitty gritty work for you and create (and manage) a site–SiteGround has something for you! There are many people who have been able to successfully ‘game’ the self-publishing world to reach a #1 best seller in a given category in a matter of days. I was never in this for the quick wins. My dream is to be the next Margaret Atwood, or the next Stephen King, or, perhaps more appropriately, the first MK Williams. I wanted to take the stories that I had been jotting down and writing and share them with the world in the hopes that they would inspire others, and that yes, maybe one day, I would be one of the well known and respected authors in American Literature. Getting to that definition of my dream was a long journey. And getting to the publication of my first book to where I am now has been another journey altogether. I feel like I can finally say that I am ready to accept that I can have a dream and that I can profit from that dream without selling out. One key thing to keep in mind is that no matter what your driving motivation is you need to define what success looks like for you. Whether you want to become the next J.K. Rowling, or just make enough income off of writing to retire, you need to go into this process with a clear vision of what success is so you will know it when you get there. I spent the first few years of my professional career in a job where I wasn’t happy. I would get home at the end of the day and do what I called “angry-writing.” I would write down these little ideas and think, “this will show them all! I’ll write this book and make $1,000,000 and never have to work again! !” As you can imagine, this work was uninspired. That experience made me shy away from the models out there that solely focus on “this is how to make money by gaming the system.” I want to still feel like I am being authentic and in it for the characters, not the money. My first two books received zero responses from any literary agents. It was only after my husband had challenged my definition of success that I finally decided to self publish. He asked me if I had to be traditionally published to be successful? 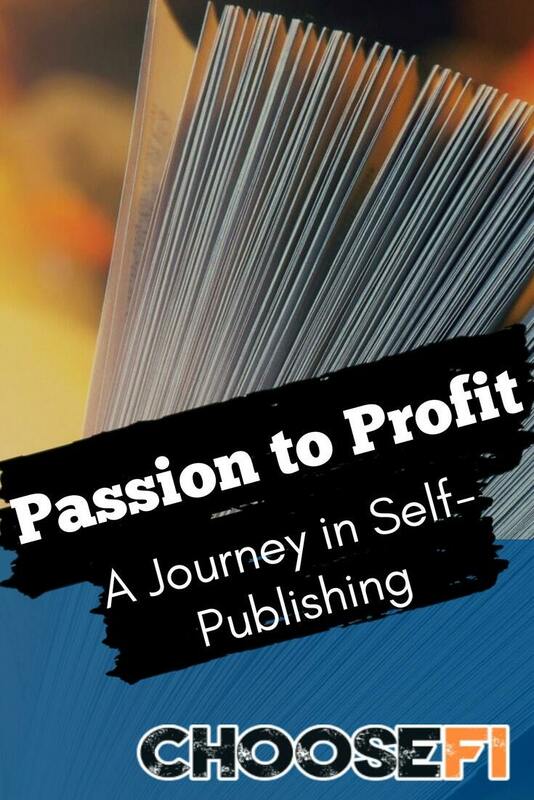 If the goal was to be published, why not self-publish? I was initially against self-publishing after years of anti-independent-author-propaganda (it’s a real thing.) It had brainwashed me into thinking that traditional publishing was the only way to go. After I did the research I realized that traditional publishing is a dying industry and that if I was going to do this, I would do it my way. That meant no middle men. Here are the choices I made that went against the grain in some cases. I knew going in that a few of these weren’t in line with what some websites were saying to do as a best practice for making lots of money. I also knew that I didn’t want to start out by employing lots of gimmicks and detract from the content of my novel. Related: MK was on the podcast. Listen to her whole story here. I wanted to keep the cost of the book low. Being a very frugal person, I haven’t paid for a book in years. I didn’t want to charge someone more than what I would be willing to pay. I also don’t like the idea of people owning so many books that they only ever read once. This caused me some angst over the environmental cost. My sales to date are 100% digital. Hah! Go figure. Not only are some of these services outrageously expensive ($200-$700), but they don’t guarantee anything. If they don’t like the book, you will get a bad review. If you get a good review then that may or may not result in enough sales to even pay off the cost of the review. Also, I began to notice that I was devaluing these reviews as I saw them online. If I see a book that advertises what was said in their Kirkus Review, I automatically start to scroll away from that book. I can’t tell if that review is genuine or simply just from a higher priced review package. No, thank you. I have participated in one review group where other authors were able to read and leave reviews. The downside is that each author in the group has different genre preferences. My science fiction thriller wouldn’t be appealing to someone who loves to read and write Victorian era detective stories. This was a mostly positive experience, but I’d rather earn my reviews the old fashioned way, which can be painfully slow. Everything I read prior to publishing said that for self-published authors that you need to give your first book away for free (some services charge you to do this) or that it needed to be $0.99. Especially if it is only available in eBook format. I didn’t want to charge more than I would be willing to pay. As a super-frugal person who hasn’t purchased a book in years (I am a HUGE supporter of the local library), it didn’t feel right to ask others for more than I would pay. The royalties on $0.99 are really small. Most of my sales come from Amazon and they take a 70% cut (at that price). I get a better cut from Barnes & Noble, iBooks, Kobo, and even the local library, but most people are already on Amazon so that’s where they shop. Kindle Unlimited requires that the book is offered exclusively through their service. That meant that I couldn’t sell it through other services (that offered higher royalties) or through the library (which I love). Still unknown. This service does pay authors based on the number of pages read so it could have potentially been another means to make money, but then I would have lost all of the royalties from the other services. Kindle does offer ISBNs for “free” to authors, but then they become the publisher of record. While I have yet to experience the meteoric success that I have planned for, by owning my ISBNs I am the publisher and still retain all control of my works. I had to spend this upfront to start the process, but I was able to buy in bulk (~$300 for 10 ISBNs) so I have ISBNs at the ready for my next project. One of the most popular (and lucrative) genres is erotica and romance. Usually the stories are “quick and dirty” to read and to write. While I’m not a prude, I don’t think I would feel comfortable writing in this genre, even if it could lead to a better ‘gamification’ of publishing. My mom can read my books without blushing. I can sell my books everywhere. I will be publishing my next book as both an eBook AND a paperback. Amazon now offers an option to make paperback books available on-demand. This means I don’t have to order a huge stock and then rush to sell out that inventory. Apparently people still like tangible books, the forests be damned. *Post publication note– turns out people hate trees. The paperback copies have far outsold the ebooks. My next book will start out at a higher price. I am still trying to work out the cost model because I know that I can’t price it too high or it will never sell. I am thinking that the eBook will be around $3.00. This will get me to a higher royalty tier with Amazon so that I can afford to pay my cover artist. Encouragement from others and finally learning that I can’t base everything on what I would do as a consumer because I am a super frugal hermit who would be happy to not buy anything, ever. Alot of the research I did indicated that after the first two books that the price can go up, this external approval is making this transition easier. My next book will be available for at least 90 days exclusively on Kindle Unlimited. Worth a try, if it proves to be successful I can continue with it, otherwise I can sell my book through other services after those first 90 days. Still no plans to write in this genre. However, I am considering a second imprint/pen-name for some quick serial detective or sci-fi books. Maybe. I recently listened to an episode of the FireDrill podcast that discussed Romance Novels as a means of side income specifically. Marketing: Yes the irony police are here. I have put almost no money into marketing my books to date. It’s not that I don’t know how, I spend all of my time at my job doing this. I just haven’t had material royalties to date that would support a larger campaign. I am trying to wait until I have profits to reinvest before tacking on additional expenses. Be true to yourself and what you are comfortable with when you are self-publishing. That’s the joy of not having an agency and publisher and a dozen other middle-men to answer to. You can decide that you want your books to make you lots of money, but it is also okay to just have this as a passion project that earns you the feeling of accomplishment and satisfaction. *Post-publication note: The new tactics were very effective. What I earned in royalties in the first two days that Enemies of Peace was available was more than what I had earned on the previous two books. The book peaked at #881 on Amazon, given the millions of books available for sale on Amazon, I’m pretty excited about that accolade.